A hearing before the New Jersey Appellate Court today plays back fiddle to word of the latest back room deal hatched by Mayor Ravi Bhalla with the Barry Brothers, re: Ironstate Development. Over the last two days, Ravi Bhalla has met with residents of the Hudson Tea Building uptown and the condo board of Metro Stop on the west side of town to discuss moving the proposed Monarch Towers to two locations of added density in the third and fourth wards. Residents from yesterday's City Hall meeting were mum but MSV has exclusively learned some of what Bhalla pitched Hudson Tea residents and the reactions were a mix of shock, anger and outrage. "He just lies right to our faces," said one resident who asked to remain anonymous but added, "It didn't go without notice, let's put it that way." Bhalla insulted the Hudson Tea Residents out of the gate saying they were invisible on the matter of the controversial Monarch Towers after the Barry Brothers backed out of a longstanding agreement to build tennis courts and parking on the eastern lot next to their building. The insult pointed to a specific meeting at the City Council where former mayor Dawn Zimmer stacked up additional density on the lot across from Metro Stop in a plan to switch the Barry Brothers from their proposed Monarch Towers location. The plan was torpedoed as Metro Stop residents were joined by dozens in the third ward lacing into the proposal crushing the possibility of any passage in the City Council. In addition, sources at the meeting were aghast when basic questions about any financial evaluation on the costs and profits of switching from uptown to two locations were met with Bhalla stammering and stuttering without any coherent answer. Tens of millions in additional profits for the Barry Brothers could be the result of ineptitude, incompetence or another backroom deal enriching all the players is what many already see as the inevitable outcome if pushback from the community doesn't take shape. Lacking any concrete financial answers, Bhalla pressed ahead that he saw two locations in the third and fourth ward as prime options to add dozens and dozens of luxury apartment units. The first is across the street at Metro Stop where controversy broke out last summer with chemical odors emanating from that Barry Brothers work site. The second location is in the fourth ward just south of the downtown "triangle" firehouse where a proposed hotel is suddenly going to be flipped into a far more profitable towering apartment building, 20 stories anyone? To make matters worse, Ravi Bhalla reportedly told Hudson Tea Building residents that both the third ward councilman (Michael Russo) and fourth ward councilman (Ruben Ramos) were already on board with his deal. This apparently came as a major surprise to both Russo and Ramos who had no clue what Bhalla's mouth was saying. The hearing before the NJ Appellate Court on the Monarch Towers today will remain in the background as Ravi Bhalla looks to cut a great deal for the Barry Brothers and himself. That is if the people of Hoboken don't have something to say about it first. Tick tock, the clock is ticking and Bhalla is trying to pull another fast one right after the weed store scam he pushed not days earlier. 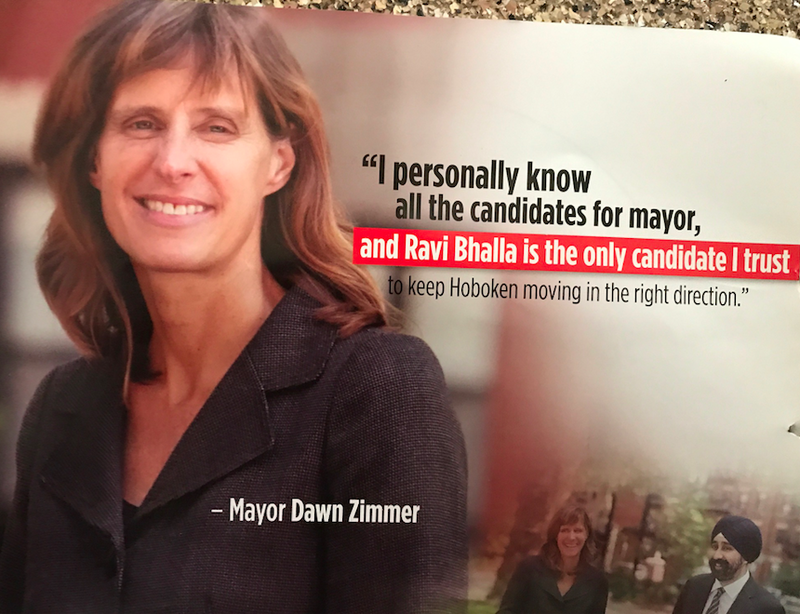 Former mayor Dawn Zimmer and her troubling infamous words on last year's mayoral race. Good job there Dawn, the Barry Brothers would like to thank you. Talking Ed Note: Savvy long-time readers of this anti-corruption website saw this coming but everyone was warned last year. So, deal with it and the prescient reference only yesterday about forging ahead or as MSV wrote, "back to the mayor's office." For more on that story, see the Hudson County View. This Horse Sense editorial, opinion learned in almost a decade of MSV's reporting in Hoboken is dedicated to those members of the vanquished Hoboken Reform Movement who told you so in 2017.